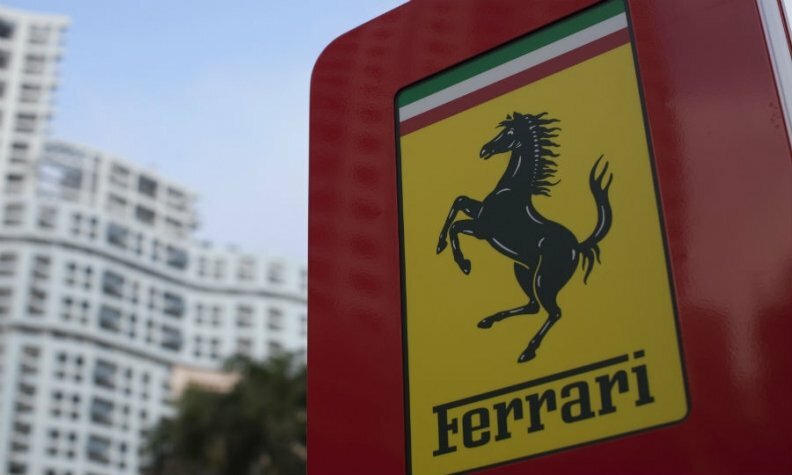 MILAN (Bloomberg) -- Ferrari will be valued at as much as $9.82 billion in an initial public offering when owner Fiat Chrysler Automobiles sells a 9 percent stake in the Italian supercar manufacturer. Including an overallotment of shares to underwriters, the valuation would reach $9.9 billion and reflect a 10 percent stake. The IPO and eventual full spinoff of Ferrari are part of FCA CEO Sergio Marchionne’s effort to raise funding to cut the parent company’s debt and help finance a 48 billion-euro ($54.5 billion) investment program that focuses on expanding the Jeep, Alfa Romeo and Maserati nameplates globally. As part of its separation from Fiat, Ferrari will take on 2.8 billion euros in debt from the company, the filing shows, and subsequently issue a projected 2.128 billion euros in debt to third parties. Including that debt, Ferrari will have an enterprise value of about $12 billion. That would be in line with the minimum $11.4 billion that Marchionne, who’s also the division’s chairman, has estimated is appropriate for a brand he contends should be treated more like a luxury-goods maker than an auto manufacturer. Chairman Piero Ferrari, the son of the founder Enzo Ferrari, gets a cash payment of 280 million euros as part of the transaction. He will keep a 10 percent stake after the separation of Ferrari. Marchionne has said Ferrari should be treated more like a luxury-goods maker than an auto manufacturer. The stock sale is set to be oversubscribed as investors remain unconcerned by the Volkswagen AG diesel-emissions testing scandal that has hurt mass-market automaker stocks, people familiar with the matter said late last month. Initial requests for Ferrari shares may exceed the amount available by more than 10 times, one of the people said. Ferrari’s earnings before interest and taxes last year amounted to 389 million euros on 2.8 billion euros of revenue as the company delivered 7,255 of its iconic supercars. The Maranello, Italy-based manufacturer, which seeks to limit the number of vehicles it makes to slightly less than demand to maintain exclusivity, said in a filing last month that it plans to raise production to 9,000 vehicles by 2019. Ferrari will stick to producing high-end sports cars, and won’t follow rivals into models such as SUVs or electric autos, as powerful vehicles with traditional growling engines are part of what customers pay for, CEO Amedeo Felisa said in September. The carmaker will be fully separated from Fiat Chrysler at the beginning of next year as FCA distributes its remaining 80 percent to shareholders. The Dutch holding company structure adopted by the supercar business replicates a strategy Marchionne used to create Fiat Chrysler and tractor maker CNH Industrial NV. It also includes a loyalty-ownership setup which will help the Agnelli family, the dominant shareholder in Fiat Chrysler, to keep voting control of Ferrari. UBS AG, Bank of America Corp.’s Merrill Lynch, Banco Santander SA, Mediobanca SpA and JPMorgan Chase & Co. are advising on the IPO.